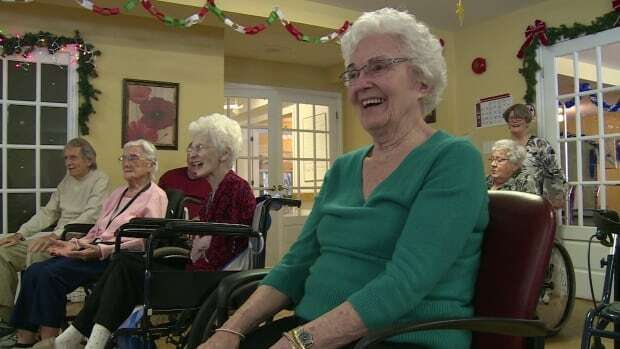 A new kind of yoga class is cracking up seniors at Whisperwood Villa seniors’ home in Charlottetown and it’s helping residents both mentally and physically. For the last couple months, seniors have been taking part in a laughter yoga class. It’s a new weekly activity for Whisperwood. 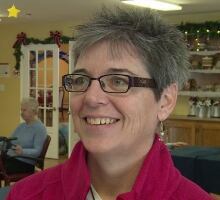 “Laughter yoga is really where we get together and laugh for no reason,” said yoga instructor Anne-Marie Rolfe. “It’s a beautiful mix of the breathing exercises which are yoga and then the exercise, the playful exercises that stimulate the laughter.” said Rolfe. Gwen Sterling, 92, says the class is a positive thing for residents. “A lot of people get down I think at our age … when you think about this class we can’t help but laugh so we don’t miss it if we can help it,” she said. Rolfe gets participants to smile about things that may be hard to laugh at. “We do an exercise let’s talk about the one where the doctor calls and we laugh at the fact that the doctor calls. So that’s an exercise to help decrease the stress around everyday things,” said Rolfe. All of the moves are modified so the seniors can do them sitting down or in a wheelchair. Staff at Whisperwood say the laughing is infectious throughout the building and more residents join in every week. “It’s just not for half an hour. They laugh the rest of the day. You hear them in the dining room, hear them in the halls. It’s really, really good,” said Peggy Zielinski, special events co-ordinator at Whisperwood. Zielinski says the yoga class is popular. Twice as many people attend compared to an ordinary exercise class. Rolfe hopes to bring the laughter yoga session to senior care centres and other facilities where people could use a laugh across P.E.I.